Living with the burden of overwhelming debt can be a frustrating and frightening experience. When your debt worries stem from high credit card payments, hefty medical bills or a mortgage loan that you can’t afford, you may be able to find relief through Chapter 7 or Chapter 13 bankruptcy. 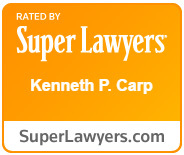 At the Law Office of Kenneth P. Carp, we understand the fears and worries associated with overwhelming debt and work diligently to offer relief to our clients throughout the St. Louis area, our attorneys provides detailed representation in the areas of mortgage foreclosure defense, bankruptcy chapter 7 and chapter 13. To schedule a free consultation to discuss your debt relief concerns, please call (636) 947-3600 or contact our office online today. Our detailed approach to your Chapter 7 and Chapter 13 bankruptcy filings allows us to help you obtain the maximum benefits the process offers, which include ending your debt concerns, putting a halt to foreclosure and garnishments, and ending the harassment by creditors and bill collectors. Through Chapter 7 bankruptcy, we can help you find relief from your debt in as little as 90 days. The process, also known as a liquidation bankruptcy, allows for the discharge of your unsecured debts. Our lawyer takes great care to help you understand which debts can be discharged and which assets are exempt from the process, allowing you to find relief from your financial worry without losing the possessions you value most. Our Chapter 13 bankruptcy guidance is designed to help in much the same way. The Chapter 13 process allows you to create an affordable repayment plan that gives you the opportunity to catch up on your past-due bills. Following successful completion of the payment plan, usually lasting 3-5 years, and your remaining debt is discharged, leaving you with a clean start to your renewed financial future. Determining whether bankruptcy is right for you – In some cases, there may be other debt relief options that can help you regain control of your finances. Our legal team will never push you into an unnecessary bankruptcy and will thoroughly evaluate your options. In addition, if you decide bankruptcy is right for you, we will help advise which type of bankruptcy filing is most appropriate based on your type of debts, assets and property, and income. Filing the bankruptcy petition – To initiate a bankruptcy case, you must file a petition in federal court. The petition must have all of the required information, as well as numerous supporting documents regarding your income, debts, and assets. If you are filing for Chapter 7 bankruptcy, you must include the means test to prove to the court that you qualify. Any omissions or inaccuracies in your petition or supporting documents can lead to delays, denial or discharge, or even bankruptcy fraud allegations. Meeting with creditors and the trustee – The bankruptcy process involves a meeting with the bankruptcy trustee who is assigned to your case in which the trustee will ask you many questions to identify any possible mistakes or inaccuracies in your filed documents. Your creditors also have the opportunity to attend this meeting to claim the debts you owe or to challenge the bankruptcy for certain reasons. Applying exemptions – In a Chapter 7 case, the trustee will liquidate certain property and pay the proceeds toward your debts. The law provides many different exemptions that you can use to protect your assets and property. These exemptions should be strategically applied to protect the maximum amount of property possible. Negotiating a payment plan – If you filed for Chapter 13 bankruptcy, you will be required to enter a payment plan in which you make payments to the court, which will then apply them to your debts in a predetermined manner. The length of your payment plan (3 or 5 years) and the amount of your payment should be based on your income, expenses, and ability to pay. Your attorney can review any proposed plan to ensure it is reasonable and can negotiate for a lower payment amount if needed to ensure your success in the process and an ultimate discharge. Seeing your case through to discharge – There are many things that can go wrong in the bankruptcy process and hiccups that can occur. To make sure you do not experience unnecessary delays and to ensure the court grants you a discharge, you should always have the assistance of an experienced bankruptcy lawyer from the very start through the very end of the bankruptcy process. We understand that no two financial situations are exactly alike and we take great care to examine yours before offering the informative advice you need to make strong decisions on how to proceed. We also understand that these issues can be both frightening and frustrating and we strive to provide the helpful and understanding guidance you deserve during this trying time.